This pixel bender plugin will create mattes that are attached to objects in 3D renders by using a PPass (also called point pass, position pass or position point pass). This plugin will create mattes that are attached to objects in 3D renders by using a PPass (also called point pass, position pass or position point pass). 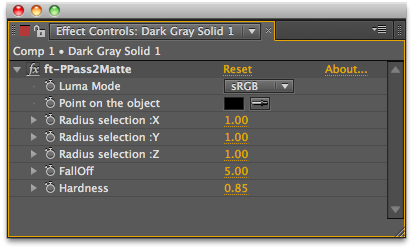 This will allow you to create custom mattes in After Effects without having to go back to the 3D program to generate them. What the demo movie (top right button) to see the plugin in action in After Effects. **Please note that this is no audio on the demo movie. Until now this functionality was only available in Nuke, so we are very excited to bring this tool to After Effects. Export a position point pass from Cinema 4D using the PointPosition C4D plugin. Add, convert, matte, round and rotate corner pins. Runs Pixel Bender filters natively using the GPU of your video card. Besides making them run very fast it also means you can run pixel bender files in CS6 and above! Simulates chroma subsampling in order to make CG slightly less than perfect. This plugin has been designed to simulate the chroma subsampling process to help better integrate perfect CG renders into video backplates. Trim your layers by a variety of methods - keyframes, mattes, markers, parent changes, selection, and visibility. This plugin white balances your footage with one click. A filter that mimics the color grading in Martin Scorsese's "The Aviator" otherwise called 2-strip and 3-strip technicolor. This plugin easily adds a highly customizable vignette to your footage or comp. This plugin will ensure your comp is not exceeding specified colors values. It will legalize those values and let you specify which should be the whitest and blackest color. This plugin quickly and easily adds a customizable vignette to your footage or comp. Create an instance of an effect with one click. Behind the scenes the script makes a copy of the effect and links it with expressions in a way that allows the instance to be anywhere including a different comp.